Preface: Passing by Pigott Hall, I saw a flyer showing Dante Gabriel Rossetti's painting Proserpine (1874). Upon closer inspection, it was an announcement for a lecture on "The Pomegranate of Don Quijote I.9" by Professor Eric Graf from the University of Illinois. A quote from Cervantes' Don Quijote I.9 accompanied the flyer in Spanish & English: "In the first part of this history we left the valiant Basque and the famous Don Quijote with naked swords aloft, about to deliver two furious downward strokes such that, had they struck true, at the very least they would have split each other open top down just as one cuts open a pomegranate; and at that most doubtful point the delicious history stopped short and was left truncated, without any indication by its author as to where one might find the missing part." Since I've not yet read Don Quixote, this passage intrigued me as well as the symbolism of the pomegranate in mythology and literature. It was 3 pm and the lecture was just an hour away how lucky I am to have seen this flyer! After some of my usual research at the Green Library, I got to this lecture about 5 minutes late. The room was filled with around two dozen faculty and students. Luckily, there was an empty chair near the front where Eric Graf was lecturing and showing slides. I didn't pick up the two pages handouts with quotes and captions of the slides until later. When I asked Prof. Graf what journal will his lecture be published in, he told me that it's already published in a book edited by Frederick A. de Armas, Writing for the Eyes in the Spanish Golden Age, Bucknell University Press (2004). Stanford Library has a copy of this book (PQ6064.W75.2004), but a faculty member had already checked it out. I put a reserve on the book, but didn't get it until ten weeks later. Figures 5, 6, 7, and 9 are Eric Graf's photographs scanned from the book as well as Figures 3, 4 and 8. The black & white photos scanned from the book were brightened and color tinted in Adobe Photoshop. The other colored Figures were downloaded from the web with links to their sources. Using my notes, Prof. Graf's handouts, and his essay in the book, I've tried to reconstruct his illuminating lecture for lovers of Don Quixote and the pomegranate. Coat of Arms (since 1981) The granada [pomegranate] in the beginning of Chapter 9 of Don Quixote has two meanings geopolitical and moral. 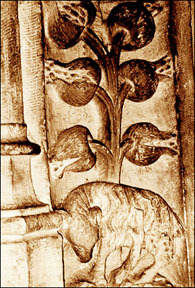 The pomegranate is a symbol of the kingdom of Granada. 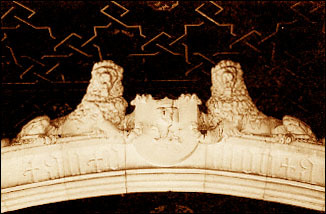 It can be seen today as a logo in the Spanish Coat of Arms (Fig. 1) found at the center of the national flag. 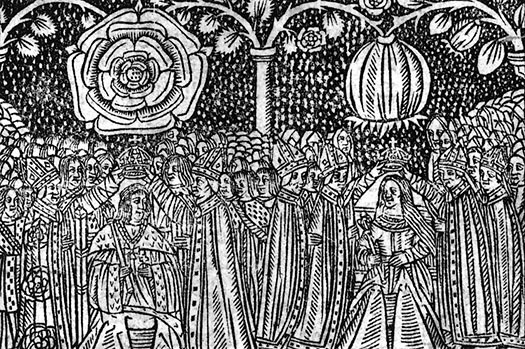 Just before the conquest of Granada in 1492, Ferdinand of Aragon said, "I will tear out one by one the seeds of that pomegranate" after which a pomegranate was added to the base of the shield on the royal standard of the Catholic Kings. This geopolitical symbolism of the pomegranate as the kingdom of Granada is repeated well into the 16th and 17th centuries. 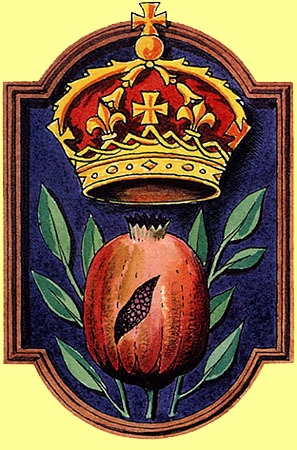 The Holy Roman Emperor, Maxmilian I (1459-1519) also adopted the pomegranate as one of his personal emblems. 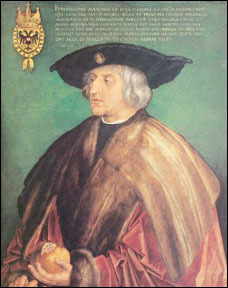 In the Portrait of Emperor Maximilian I (1519) by Albrecht Dürer, the Emperor holds a pomegranate in his left hand (Fig. 2). 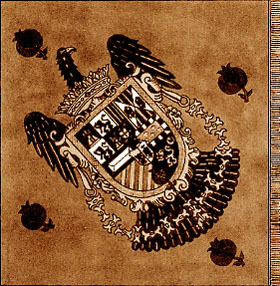 During the time of Cervantes, the Royal banner of Kings Philip II and III continued to display this symbol at its center (Fig. 3). Perhaps most interesting for a decentered reading of the significance of the pomegranate in Don Quixote is the pomegranate's appearance on the Estandarte de Caballeria [Banner of the Cavalry] of 1580 (Fig. 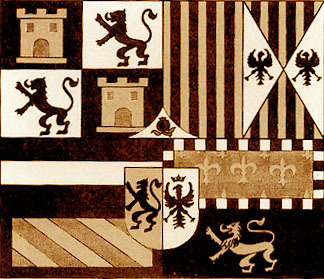 4), a flag with which we might imagine the novel's peerless knight-errant would have been intimately familiar. Given the fact that Toledo is the place where the second narrator of the 1605 Quixote ultimately finds the Arabic continuation of the adumbrated text as well as the mysterious bilingual agent who agrees to execute its translation, we must take the mention of the pomegranate at the beginning of Chapter 9 as a reference to the type of symbolism that abounds in this town. Monastery of San Juan, Toledo "Even though I recognized them, I still could not understand them, and so I walked around to see if there might be some Spanish-speaking Morisco about, who would be able to read them; and it was not very difficult to find such an interpreter, for even if I had wanted one for another better and much older language, I would have found one." Given its clear and common geopolitical significance, when Cervantes evokes the pomegranate at the precise moment in which he freezes the action of the battle between the Castilian knight and his Basque adversary, only to then introduce us to it again by way of a text discovered in a town famous for its ancient Jewish population, a text written in Arabic by Cide Hamete and then translated into Spanish by a Morisco, he has created a linguistic, cultural, and geopolitical emblem of the entire history of Spain. Surely the famous windmill at the beginning of Chapter 8 anticipates this dizzying indeterminacy of familiar ethnic and religious subject positions. Nevertheless, for Cervantes, although peninsular history is primeval and includes the histories of the Celtic, Roman, Jewish, Visigothic, and Arabic civilizations, in the final analysis it has come down to a conflict between Basques and Castilians in the north and, subsequent to that, a conflict between Castilians and Moriscos in the south. Tanto monta monta tanto it would seem, or, as one might say in English, "what goes around comes around." But the sequence of thes two north-south encounters, which revolve around the axis of the geopolitically symbolic "granada" and the sudden shifting of perspectives at the transition between Chapters 8 and 9, does indeed follow the course of history: they are part of the novel's general trajectory toward ultimate encounters, or "limit experiences," with the Arabic Other. I offer three key examples. First, when Don Quixote comes across the Basque at the end of Chapter 8, he is on the royal road that leads south from Madrid and Toledo toward Andalucia, and earlier in the same chapter he has already expressed his intention to imitate a certain Diego Pérez de Vargas y Machuca, so called because he once pounded so many Moors, that he was given the surname of the Pounder. Second, the convoluted Sierra Morena episodes that form the main body of the rest of the novel take place precisely on the mountainous frontier between Castilla and La Mancha and Granada. Third, if the endpoint of the entire novel is, as Luis Andrés Murillo has observed, the "Captive's Tale" of Chapters 39-41, then surely the central character that awaits us there is the Christianized Moor technically speaking, now a Morisca the enigmatic Zoraida-Mary figure who has followed the Captive in his journey back from Algiers. 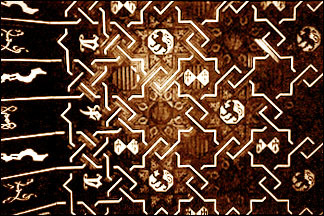 If the "Captive's Tale" is the endpoint of the 1605 novel, then the Monastery of San Juan in Toledo gains further momentum as a material source for its symbolism. Monastery of San Juan, Toledo In addition to the prominent use of the pomegranate in the structure's cloister (Figs. 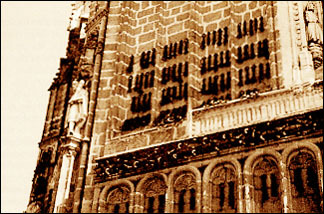 5-7), the monastery is most famously known for its display on its exterior walls of the chains of the Christian captives freed by the reconquests of Málaga and Almerí (Fig. 9). In this light, this Monastery suggests one of those archetypal architectural structures upon which Don Quixote as an "art of memory" might have depended for its ultimate shape (Frances A. Yates, The Art of Memory, 1966). "Captive's Tale" as a dyad the chains represent the exterior world, the pomegranate, the interior world. The way to be free of the endless cycles of ethnico-religious reciprocal violence is to affirm the Other (Zoraida) as the bearer of religious meaning (Mary), to learn to apply the antidote of a new and more ethnically diverse and tolerant philosophy at the sites of cultural conflict. In short, the geopolitical pomegranate at the beginning of Chapter 9 is but one of a cluster of details that converge to indicate that Cervantes' principal concern while writing Don Quixote was the Morisco question. While the novel certainly evinces a technical attempt to come to terms with Aristotelian precepts, it is more properly understood as both a spirited response to the bloody Alpujarras War of 1568-70 and a grim anticipation of the Morisco expulsions of 1609-11. Perhaps the crowning detail here is the ironic fact that Toboso, the toponym of Don Quixote's ultimate love object, was inhabited by a large number of Moriscos from the kingdom of Granada. Prof. Graf showed 9 slides of paintings with the pomegranate motif (Figs. 8.1-8.7 & Figs. 10.1-10.2). I've found 7 of them on the web, but can't find Fig. 8.3: Hans Holbein the Elder (1460-1524), "Saint Mary Hands a Pomegranate to the Child" [Vienna's Kunsthistorisches Museum] and Fig. 8.5: Francesco Segala (active 1557-97), Allegorical Scene, [Museo del Settecento Veneziano, Ca' Rezzonico, Venice]. Graphische Sammlung Albertina, Vienna In conjunction with its geopolitical significance, the "granada" also has a moral symbolism dating from medieval times. According to J. E. Cirlot, "the pomegranate is a perfect illustration of multiplicity because it is internally subdivided into a multitude of cells", and it therfore manifests "the symbolic doctrine that the totality of the individual has no value until it has become transmuted that is, until the individual has destroyed in himself the desire for dispersal in space (corresponding to multiplicity) and in time (corresponding to transitoriness) so that ultimately he may be transformed into an image of the One and so be assimilated into the eternal principle." 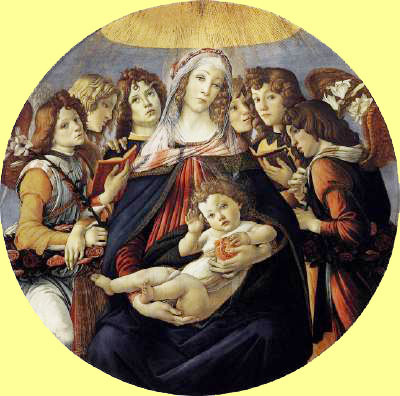 The pomegranate also corresponds to the womb: its biblical name rimmon derives from rim, "to bear a child", and its association with the Virgin Mary and the Christ child is common in medieval art. Its blood-red color and its many seeds make the fruit an emblem of the Christian community, a kind of sacrificial figuration of the paradoxical motto "E Pluribus Unum" [from the many One]. Cervantes has injected a geopolitical signifier into a key moment of his narrative, a signifier tat should orient the reader toward the contemporary social tension in southern Spain, but he has also supplied a Christian symbol of peaceful harmony as a kind of transcultural antidote to the whole bewildering history of violence between Basques, Castilians, Jews, Christians, Arabs, Moors, Moriscos, and Muslims. A contemporary parallel to Cervantes' use of the pomegranate can be found in Lope de Vega's play Juan de Dios y Antón Martín (1608-1611) written during the Morisco expulsions of 1609-1611. About halfway through the first act of this play, Juan de Dios, a former pastor, but now a soldier, ponders on his decision to take up the sword: "I am exhausted; I want here / to sit and ponder what to do: / Oh, my God, where am I to go? / What is my purpose in this life? / Which way shall I direct my steps / so as to find you, my good God? / How or where shall I go to you, / for I do not know...?" At this point a divine voice is heard, and Juan has a vision of the Christ child who directs him to go to Granada and become a Hospitaler. According to the play's stage directions: "Enter a pilgrim-child, with an orb-like pomegranate". Further on, as Juan gazes at the pomegranate, "It opens in four parts, and in the middle is found a cross", at which point the child explains the symbol: "Let us divide it, but behold: / this divided pomegranate / constitutes the fruit of your life / by way of the seeds of my death, / which are but drops of human blood. / Go to Granada: you will find / the poor for whom you are to have / my grace and my benediction." [Eric Graf translation] These verses manifest a political theology that disallows the easy self-righteousness of military conquest, insisting instead on unconditional Christian love of the Other as the only means of healing a divided kingdom. inhabitants are very much in agreement and united." "It is He who sends down water from the sky with which We bring forth the buds of every plant. From these We bring forth green foliage and close-growing grain, palm-trees laden with cluster of dates, vineyards and olive groves, and pomegranates alike and different. Behold their fruits when they ripen. Surely in these there are signs for true believers." A comparison between Cervantes' broken episode between Chapters 8 and 9 of the 1605 Don Quixote and Salvador Dali's Dream Caused by the Flight of a Bee around a Pomegranate One Second Before Waking (1944) (Fig. 10) clarifies the dynamics of the geopolitical and moral symbolism in both compositions. The postmodern surrealism of Dali and the iconographic Renaissance Christian humanism of Cervantes are strikingly similar in technique in three principal respects. First, both artists use the deploy a telescopic combination of ancient and contemporary history. 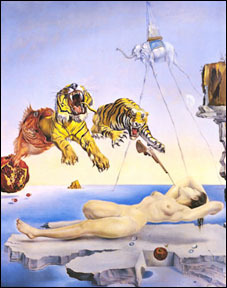 Dali frames his surreal event with the elephant invasion of Hannibal and the rifle of the Spanish Civil War. Cervantes moves between the Castilian / Basque fusion of the medieval period and the tensions in southern Spain during the Renaissance. Third, both render social conflict on the peninsula as a mimetic masculine rivalry and female in jeopardy. The threatened female figure is positioned at the endpoint of an historical & geopolitical trajectory. Dali's Gala-Venus-Humanitas is Proserpine with the pomegranate offering salvation to a Spain that has just suffered a civil war. Cervantes' Zoraida-Mary-Humanitas offers a peaceful resolution to the Spanish labyrinth of the 16th century. In each case, a mythologically and morally coded cosmos not only indicates the ultimate "textuality of history" but perhaps also expresses the hope that if we can imagine a better world, then we can also make one. 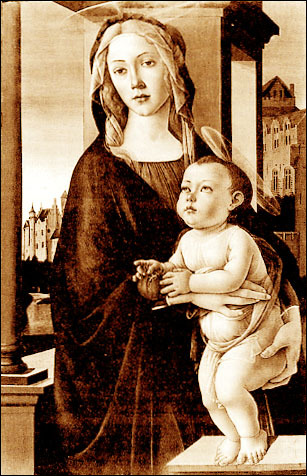 Tate Gallery, London The Madonna con bambino [Virgin and Child] painting (1490) by Sandro Botticelli (Fig. 8.1) is one of many medieval paintings that make explicit use of the common Christian significance of the pomegranate. The years Cervantes spent in Italy before the Battle of Lepanto mean that he could be making a direct allusion to Botticelli. George Camamis ["The Concept of Venus-Humanitas in Cervantes as the Key to the Enigma of Botticelli's Primavera." Cervantes 8, no. 2:183-223 (1988)] suggests a kind of painterly roman à clef Cervantes' prose may very well operate according to a series of allusions to Renaissance masterpieces by the likes of El Greco, Raphael, and Botticelli. Camamis's argument that La Galatea and La gitanilla are structured according to some of the most subtle details of Botticelli's Primavera [Spring] is at times very compelling. 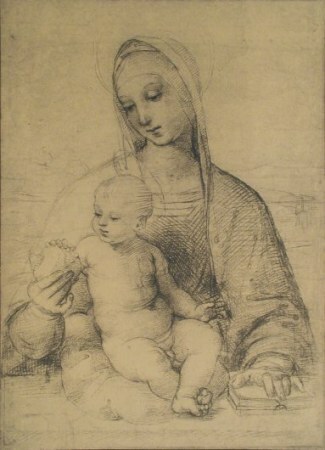 If we allow his argument, even in part, then we might also want to consider the possiblity that Cervantes appropriated and relocated Botticelli's Madonna con bambino as one of the ultimate organizing principles of Don Quixote. The pomegranate at the beginning of Chapter 9, positioned precisely at the intersection of an emblematic battle between a Basque and a Castillian and precisely at a textual rupture that serves to frame this battle with the Morisco issue of southern Spain, may have been intended to function in combination with the moral implications of the Zoraida-Mary figure of the "Captive's Tale". Conclusion (from book): Cervantes' writing anticipate contemporary literary theory in ways that we cannot and should not ignore, it routinely does so in dramatically ethical fashion and precisely at moments when the text is also in dialogue with very specific social formations and very specific social conflicts. The formal splintering between Chapters 8 and 9 of the 1605 Quixote is a self-conscious demonstration of both the textuality of history and the historicity of texts. On the one hand, Cervantes underscores that history is experienced differently by different peoples (Basques, Castillians, Jews, Christians, Arabs, Moors, Moriscos, and Muslims) and so there can be no inherently "true" version of its events, only different perspectives on, and different translations of, said events. Cervantes' radical textual experiment plays with the perpectives of his characters as well as with those of his readers, signaling his awareness of historical relativity. On the other hand, neither can texts every fully escape the history in which they are produced, and so, for better or for worse, they will always be at least partially conditioned by the events that surround them. Cervantes' rigorous attention to the violent realities of his world indicates a self-conscious attempt to historicize his own novel that is, to make his text speak to the more important social issues of his day and represent his society as a continuous work in progress, a contingent mixture of various cultures as opposed to a static model that would privilege Castilian "purity". For Cervantes, I believe, an ethics based on "perspectivism" was an attempt to avoid violence in the 17th-century southern Spain, or more to the point, it was an attempt to disallow the kind of Castilian aggressivity embodied by the hidalgo class of the 15th century and still operative inthe expropriation of Morisco lands during the 16th and 17th centuries. Clearly, the degree of the success of Cervantes' self-assumed "cultural work" is debatable, but his intentions remain quite clear. Whether or not he succeeded in changing his readers, we do know that he considered this change to be the ultimate purpose of his texts. In his prologue to the Novelas ejemplares of 1613, Cervantes spells out his plan: "My purpose has been to place in the plaza of our republic a game table which everyone can approach to entertain themselves without fear of being harmed by the rods; by which I mean without harm to spirit or body, because honest and agreeable exercises are always more likely to do good than harm." Given Cervantes' vision of the novel as the performance of a kind of "cultural game" for the betterment of his society, we must attend to one final interpretation of the pomegranate at the beginning of Chapter 9. According to Sebastiaán de Covarrubias's 1611 edition of the Tesoro de la lengua castellana o española: "The pomegranate can be a symbol for a republic whose inhabitants are very much in agreement and united." It is a morally driven version of this political unity that Cervantes seeks as the fruit of his textual labors. 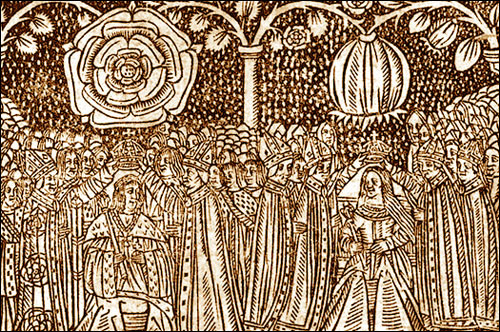 His particular use of the pomegranate as potentially split open by the intercultural violence between Basques and Castilians short-circuits the easy symbolism associated with the imperial conquest of the kingdom of Granada, and substitutes a far more difficult one that seeks to achieve political harmony among the diverse citizens of a republic. Such details, along with the high degree of narrative attention given to intercultural love affairs, like those between the Captive and Zoraida in the 1605 Quixote and betwen Don Gregorio and Ana Félix in the 1615 continuation, are clear indications of the author's pro-Morisco agenda: political harmony in 17th-century Spain must not exclude the Arabic Other. Q: What was Cervantes view toward the Moors & Christians? rapprochement after his jail sentence . Relative respect of the Christian population. in Chapters 8-9 is a further consequence in the novel. Toledo used as the transitional center. How is this text related as a whole? reference as a madman and Christian pacificism. Don Quixote attacking people is seriously flawed. Don Quixote is a negative exemplar. that blood runs he's not a good exemplar. Windmill is a symbol of Dutch technology & ethics. Q: Are there pomegranate symbol in other works? A: The only instance I've found is in Derrida. He has a 1996 essay on the pomegranate. deals with religion and reason. of geography & the Hapsburg Empire? after the Taliban was "Pomegranate"
The Moorish can't drop a pomegranate seed. beginning of the fall of dissension. for Morisco's claim of divine right to Spain. "Your blood and race don't concern me. Your ideas are what concern me." The lecture and discussion ended at 5:05 pm. it appears as a symbol of the Oneness of the universe. It is also symbolic of fecundity. plenty. Buddhist: One of the Three Blessed Fruits, with the citrus and peach. which grew from the blood of Dionysos. Hebrew: Regeneration; fertility. she was allowed to return to her mother only half of the year during spring and summer. Dante Gabriel Rossetti (1828-1882) was a member of the Pre-Raphaelite Brotherhood. which resemble a section through a pomegranate. "Italy for picking a kernel out of a pomegranate"
Believe me, love, it was the nightingale"
"Look down into the pomgarnet, Ralph"
a pomegranate, upon the hem of the robe round about. wine of the juice of my pomegranate. of the orchard-have withered. Indeed, human joy has dried up. and the olive tree have not yet produced. But from this day on I will bless you. the pillars; and made an hundred pomegranates, and put them on the chains. on each wreath, to cover the two pommels of the chapiters which were upon the pillars. pomegranates upon the network were an hundred round about.